Eminent Scholar monk and indefatigable campaigner for peace and reconciliation Most. Ven. Professor Bellanwila Wimalarathana Thera bade farewell to the nation, including his Sangha fraternity and faithful devotees yesterday proving the Buddhist doctrine of impermanence of life he expounded. Eminent Buddhist prelates, President Maithripala Sirisena, Prime Minister Ranil Wickremesinghe, Ministers, Parliamentarians and other eminent persons were among the gathering present to bid farewell to the Most Ven. Thera. Lakhs of people belonging to all communities, and religions earlier filed past the Ven.Thera’s remains to pay respects as it was kept at his abode, the Bellanwila Raja Maha Viharaya. As the remains were taken to be placed in the ‘Ranasivige’ to be taken in procession to the cremation grounds at the Sri Jayewardenepura University, cries of Sadhu Sadhu and Nivan Suwa Labewa raised by the gathering reverberated the Raja Maha Viharaya premises which was solemn and silent as a mark of respect to the Prelate. 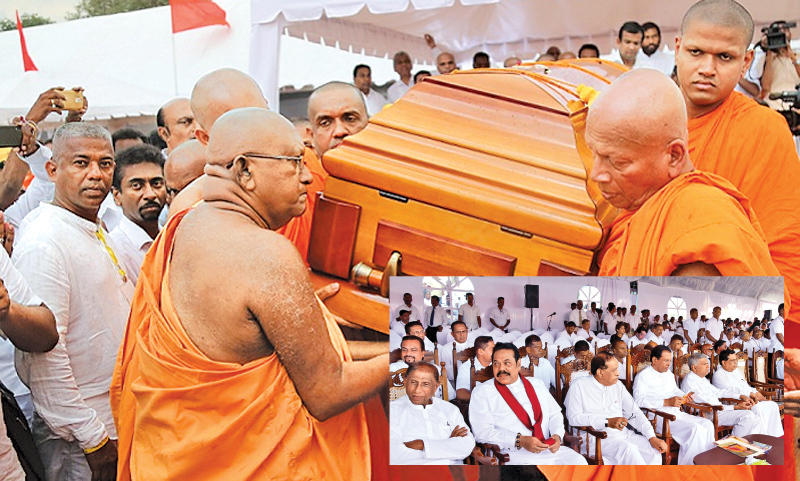 The members of the Dayaka Sabha led by its President Speaker Karu Jayasuriya placed the Casket in the Ranasivige. As the funeral procession wended its way through Boralasgamuwa junction, Rattanapitiya junction and university road on its way to the university grounds, thousands of people lined the route to pay their respects to the revered Prelate. At the entrance to the Sri Jayawardenepura University the Ransivige was received by the university fraternity including Vice-Chancellor Professor Sampath Amaratunga,Dons and students and conducted into the cremation site at the university grounds to be placed near the funeral pyre. Matakavastra Puja was conducted to pass merits on the Thera after the welcome speech by Chief Incumbent of Bellanwila Rajamaha Viharaya and Chief Sanganayake of Singapore Ven. Bellanwila Dhammarathana Thera. Ven.Dhammarathana Thera in his speech said that the Passing Away of Ven. Bellanwila Wimalarathana Thera is an irreparable loss to the Buddha Sasanaya. Director of Post Graduate Institute of Pali and Buddhist Studies of the Kelaniya University Ven Professor Kotapitiye Rahula Thera delivered the Anusasanawa. Archbishop of Colombo Malcolm Cardinal Ranjith in his speech appealed to all Sri Lankans to preserve Buddhist heritage in the country. President Maithripala Sirisena and former President Mahinda Rajapaksa in their speeches said that Ven.Bellanwila Wimarathana Thera left an indelible imprint in the Buddhist world. After funeral orations the casket bearing the remains were placed by the members of this Dayaka Sabha, relatives and devotees in the funeral pyre. After pacing round the pyre thrice two nephews of the late prelate performed the customary duty of setting it alight.